Gnomes are a short but highly intelligent race of innovators and explorers. They are lovers of nature and mostly inhabit the forests east of the Arandar Mountains. Although initially appearing as a peaceful, friendly, and somewhat simple people, this is deceptive. Gnomes have in the past raised great armies and can use their technologies to stunning effect. A significant proportion of them have left their homes to found a hidden city that could be very dangerous indeed. 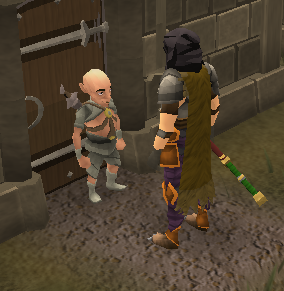 Gnomes travelled to Gielinor in the first age after Guthix used his elder sword to open a portal (the ‘World Gate’) into their lands, in much the same way as humans, dwarves, fairies, and elves came. 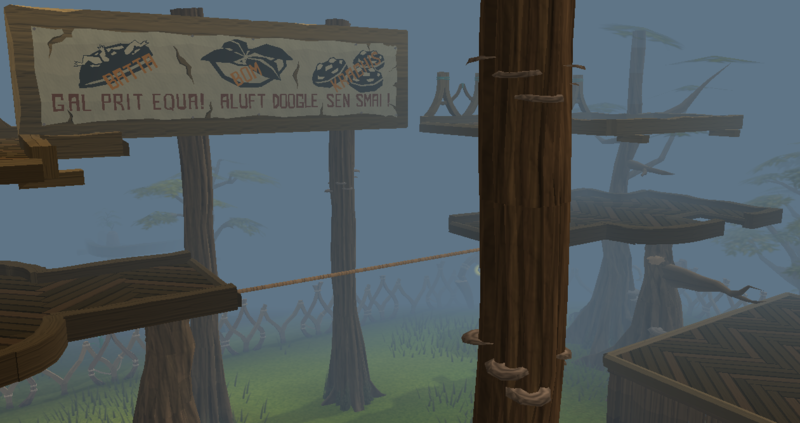 Although little evidence remains of this time, it seems likely that they prospered along with other races until Guthix chose to sleep, building a resting place for himself and hoping memory of him would fade away. 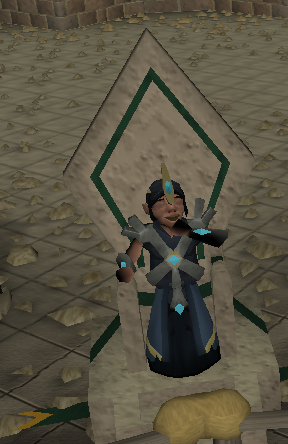 During the second age, however, different gods came to Gielinor. These chose to take followers, presumably importing some and allying with the now native races. 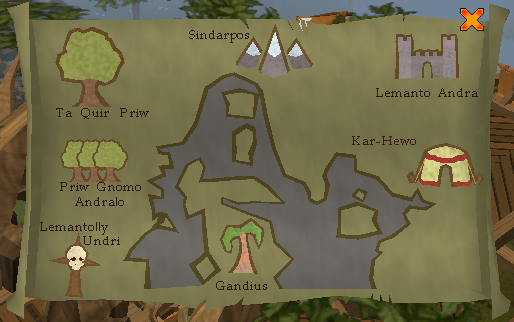 At this time, Zaros’ influence was its peak, but current gnomish lands would place them under Seren and Armadyl. However, it is unclear whether gnomes lived there then or migrated afterwards. 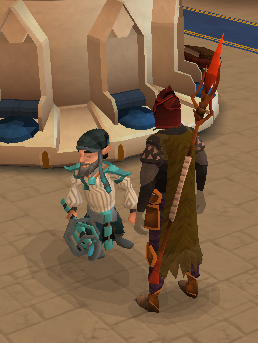 Whatever god gnomes followed, if not Guthix, is unclear. It was in the third age, after the betrayal of Zaros, that the God wars erupted as Zamorak attempted to claim all lands. 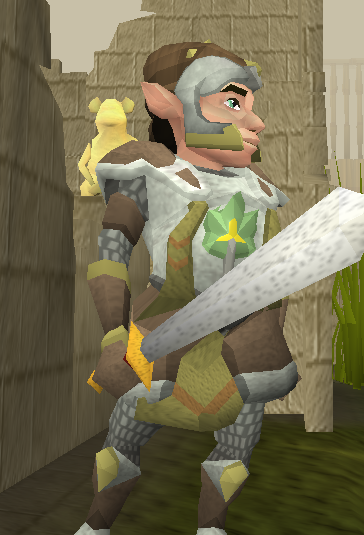 The gnomes, not intended by Guthix to be a race of powerful warriors like majharrat or icyene, may have contributed some fighting force for a Guthixian army, but if so are not mentioned. One theory is that (like certain goblins and dwarves) they hid underground during this time, something that gnomes have certainly been shown to be capable of doing. Almost no cities survived the god wars, and again no record remains. 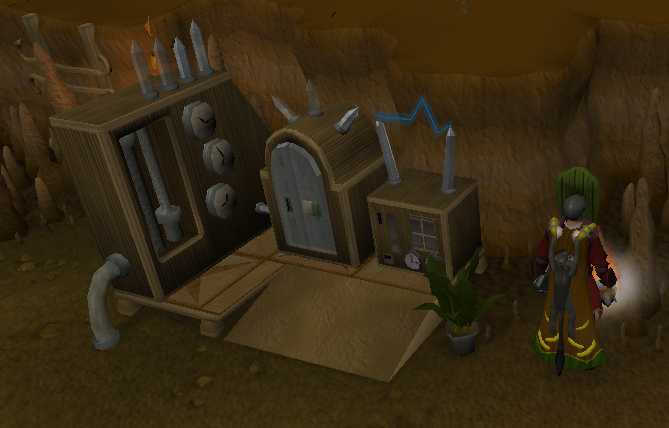 After the edicts of Guthix began the fourth age, gnomes began to rebuild. They emerged from their hiding places and, avoiding humans, they planted the roots of the Grand Tree and with great magic inspired it to grow into a grand stronghold. In their language it is ‘Ta Quir Priw’, ‘The Guardian Tree’, and this reflects their need for protection during this period. At this time, they also established dominance over the goblins by winning the Battle of Atarisundri, but suffered from an internal divide when Glouphrie, responsible for the victory over the goblins, chose to kill a spirit tree and then left to found the city of Arposandra. Glouphrie (now called ‘The Untrusted’) committing this crime caused a mild distrust of magic users among the gnomes, and his hidden city, Arposandra, created the ‘Poison Waste’ south of Tirranwn. Since then and during the fifth age Glouphrie has become involved in a number of schemes to further his cause, destroy the grand tree, and increase his power by experimenting with the ‘Anima Mundi’ or ‘life force’ in all things. 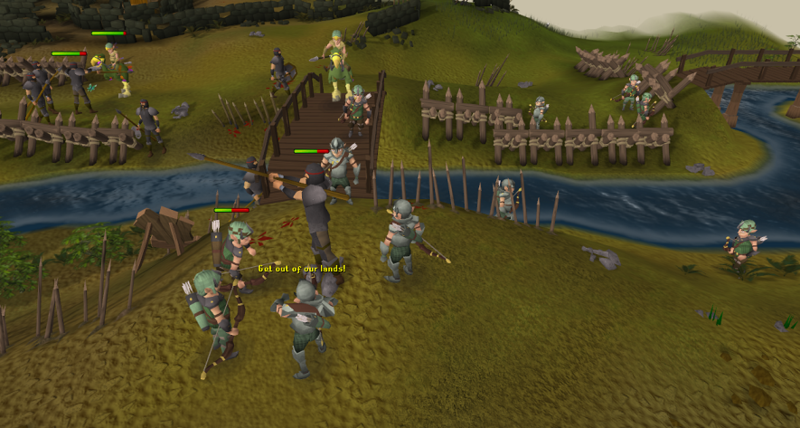 Meanwhile, gnomes have been forced to go to war once again after the human army of the Majharrat Khazard attacked them. Gnomes have had a very different experience to humans over the years, and this has given them an unusually guarded but at the same time exploratory society. Gnomes have three clear options available to them in life: to stay in their strongholds, enjoying life and learning a particular skill, to explore the world, expanding gnome knowledge and increasing gnome abilities, or to go to war, fighting in the service of their kings to defend their lands. Additionally some gnomes have chosen to enter Arposandra. Gnomes live long lives (some are alive who saw the 4th age, almost 170 years ago) and thus can become exceptionally skilled. They are a fairly insular society, keen to enjoy things that are different from other races. The Tree Gnome Stronghold exhibits a variety of crafts that have been pursued by gnomes, from clothing fashions to cocktails to gnome cooking, which is an intriguing mixture of small meats, fruit, and spices, along with healthy amounts of dough. Gnomes in strongholds give their time to gardening, eating, drinking, sport, and agility training, all of which are handled quite differently to humans. Meanwhile, a gnomish military is also unusual compared to a human one. Rather than fighting entirely on foot, gnomes are keen to implement war beasts, trained giant tortoises and terrorbirds that carry them into battle. They have gliders that can fly them in, elite squads to fight behind enemy lines, and small amounts of light artillery. Gnomes may not use gunpowder and cannons (as dwarves and humans do), but they do not hesitate to use magic, both for defence and deception. As such, while gnome armies are not perfect attackers, they can certainly defend their homes despite their individual apparent weakness. Finally, a vast number of gnomes choose to travel and innovate. Several act as ambassadors and scholars, aiming to learn from human ways and bring back potentially interesting findings. Others explore different sections of the world more generally, learning about environments, wildlife, and so on. Another group tend to pick specialised trades that can’t be practiced in the stronghold: for example, some are great hunters, some operate glider routes, some may be wandering champions, and some are just retreating from stronghold life. While they keep in touch with gnomes back at home, they tend to be more specialised. Wingstone, a gnome explorer in the desert. Brimstail, a gnome scholar located at the Tree Gnome Stronghold. Glophren, a mysterious fighter at the Champion's Guild. 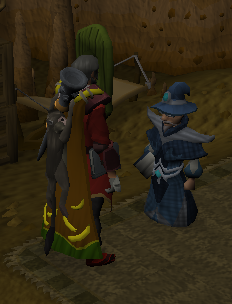 Professor Onglewhip, one of the few voice acted gnomes and a magical scholar at the wizard's tower. Laidee Gnonock, a friend of Ghommal's at the Warrior's Guild. Gnomes are ruled by elected kings. Although gnomes often marry and have families, kings do not visibly have queens or consorts. It is hard to assess the views of gnomes, because they have not been overly ready to share them. It is clear that they are keen on establishing friendly relations with human kingdoms and learning from them, but some among them, such as Glough, have been known to hate humans and would prefer to invade their lands. Although one assumes they mostly follow Guthix as they were introduced by him and give no clear worship to any other god (a fairly Guthixian trait) their links to elves and crystal imply a mild connection to Seren. 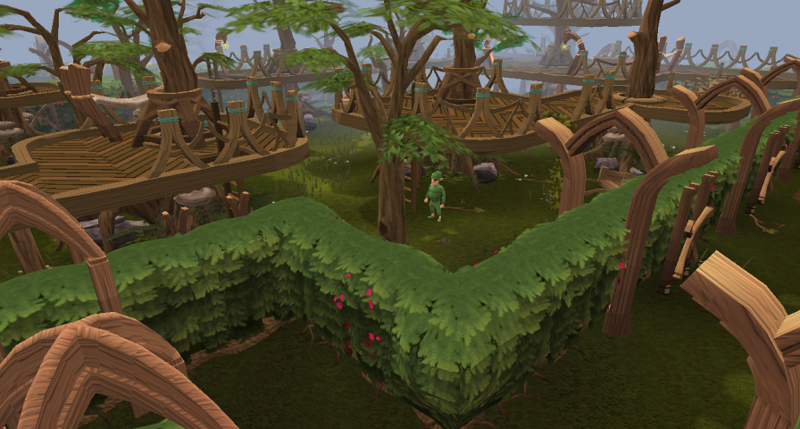 While many Guthixians enjoy nature, Guthix is not a nature god and thus their love of trees and wildlife does not necessarily make them Guthixian. However, any gnomes living in Arposandra seem unlikely to follow either. 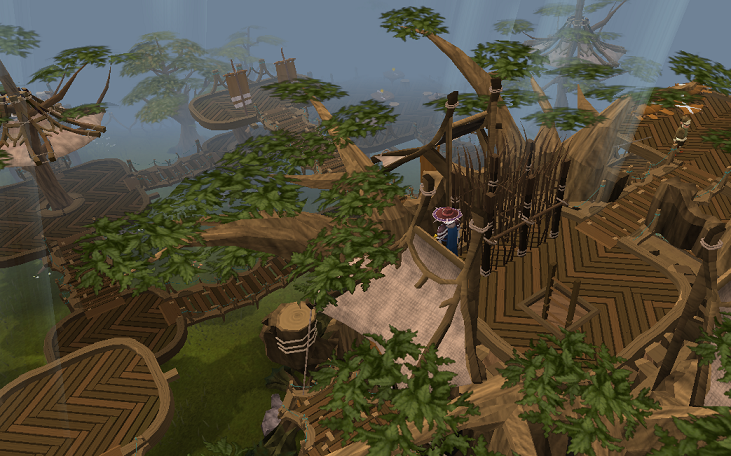 Arposandran’s work with dwarves, apes and some humans to spread chaos and dissent imply a connection to Zamorak. With that said, there is no open worship of any god. Fly, using personal gnomecopters and gliders that hold a gnome and human (including military grade gliders, which drop off elite squads in war). Talk to and influence certain spirit trees, and generally have unusual power over nature, allowing them to make natural megastructures like the grand tree. Ride, by training terrorbirds and tortoises for warfare and civilian use. It is worth noting that humans have never achieved anything like this, although the royalty of Varrock once used a carriage drawn by 4 unicorns, and some humans hold that there once existed a cult of ‘dragon riders’. Cook a variety of genuinely unusual food rivalling human variation but within one settlement. Gnome cooking involves a base dough turned into a variety of fruit-based (though with some invertebrate meat) and spice-topped creations, among which are the famous ‘gnome crunchies’, a type of biscuit. Again, humans do not have these. Brew a variety of distinct ‘cocktails’, which in contrast to the human pastime of slowly fermented beer (and, to a lesser extent, wine), is made with hard spirits and (again) fruit. Create machines which, through no magical skill of the user, can dispel the most powerful of magical illusions. Successfully transformed terrorbirds and tortoises into beings capable of higher thought and operating complex machinery. Created chaos dwarves, a ‘sub-race’ of mindless, but significantly stronger, dwarven warriors. Subdued or created ‘watcher’ creatures that appear friendly but are able to see and report back anything significant. Note: This section contains quest spoilers! Tree Gnome Village- the player helps gnomes fight General Khazard’s forces and restore the magical protection of the Spirit Tree over the village. The Grand Tree- the player helps gnomes find that Glough, a tree guardian, has planted daconia rocks by the Grand Tree’s roots in order to kill it and use the timber for a gnome invasion of Port Sarim. Monkey Madness- on the way to decommission the shipyard used by Glough, the 10th squad, an elite group of gnomes fighters, is blown to Ape Atoll. The player helps rescue them and foil a plot by Arposandran gnomes to have them killed in the hopes of starting a gnome-human war. The Eyes of Glouphrie- the player helps show that the ‘cute creatures’ in the Tree Gnome Stronghold are in fact evil Arposandran spies, by using an anti-illusion device. The Path of Glouphrie- the player shows a similar truth in the Tree Gnome Village, and discovers the source of Tirranwn’s poison waste: a sewer containing warped terrorbirds and tortoises, the failed results of generally successful experiments in making these creatures intelligent by Arposandran gnomes! A gnome mage saves the player from death by gassing. Prisoner of Glouphrie- the player helps rescue Bolrie, a former gnome king, from the dungeons of Arposandra, with the help of a gnome adventuress. Enlightened Journey- a gnome works as an assistant to set up a balloon route to the Grand Tree. Forgettable Tale of a Drunken Dwarf- a gnome ambassador meets with Hreidmar of the Red Axe. Forgiveness of a Chaos Dwarf- a gnome technician helps create Chaos Dwarves. Grim Tales- a gnome is imprisoned by a witch after poking around too much. Mourning’s End Part I- a gnome prisoner helps fix a device used to colour sheep. 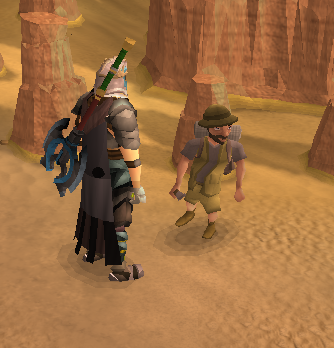 One Small Favour- a gnome recruits the player to set up a landing strip for a glider in the Feldip Hills. Perils of Ice Mountain- a gnome naturalist helps to collect baby icefiends, attempting to save them from near extinction on Ice Mountain. While Guthix Sleeps- a gnome mage is among the party of heroes that goes to fight the Mahjarrat Lucien. Within the Light- the same gnome prisoner helps create a distraction, allowing the player and Airanwyn to enter the Temple of Light.